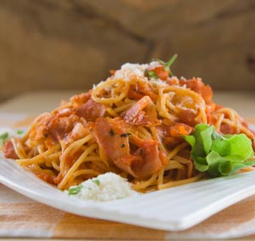 Bacon and Tomato Pasta - A recipe from Savor California, the online showcase for extraordinary gourmet foods and beverages from California. In a large stock pot, boil 3 quarts of water. When boiling, add pasta and cook until pasta is al dente. In a large sauté pan over medium heat, sauté bacon until crispy. Remove bacon to drain on a paper towel lined plated and remove ¾ of bacon fat from the pan. Add extra virgin olive oil and onions, and cook until onions are translucent. Add Mexi-Mix and Garlicsaltless, cook for 2 minutes then add tomatoes. Sauté for 5 minutes, then deglaze with wine. Drain pasta and add to the tomato mixture. Add Tuscany-Mix and bacon. Toss with Parmesan and fresh basil. Add Original All-Purpose to taste.